Powdered Brewery Wash: a cleaner hand-tailored for the brewing industry! PBW (Powdered Brewery Wash) is an alkaline cleaning agent used extensively in the professional brewing industry to clean a range of brewing equipment, from brew kettles to fermenters and bright tanks. It has been specially formulated with a mixture of buffering agents that makes it safe for use in cleaning most metals and plastics, as well as safe on skin. It uses oxygen to penetrate carbon and protein soils, and is not affected by hard water. It is environmentally friendly, too! 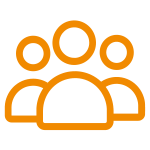 PBW is used by professional and home brewers alike to keep their equipment clean. While the company recommends a rate of 1 to 3 ounces per gallon for general cleaning, we have found that a rate of 1 to 2 tablespoons dissolved in 5 gallons of hot water makes an excellent soaking solution that requires little to no scrubbing to remove even heavy soiling. 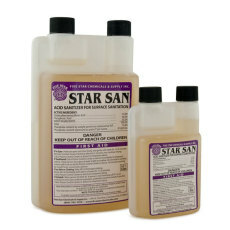 PBW needs to be rinsed after use, at which point equipment can be sanitized with a no-rinse sanitizer, such as star san or IO Star. 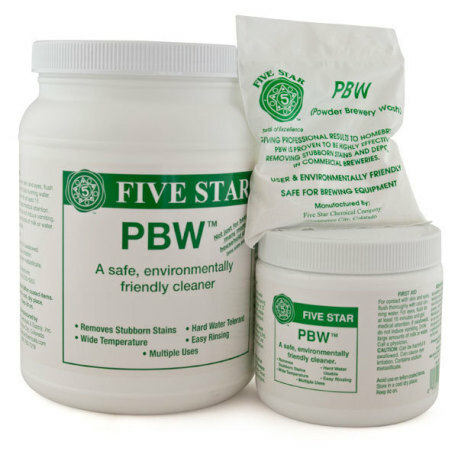 If you don't already have a preferred cleaner, we highly recommend giving PBW a try! Great for cleaning glass carboys! I use this stuff to clean out my glass carboys after fermentation. I use the following procedure and virtually no scrubbing is required: 1) Rinse out as much sediment as possible with cold water. 2) Then rinse once with warm water and a little dish detergent. 3) Put 1/3 cup of PBW in carboy and fill to the brim with scalding hot tap water. 4) Let it sit overnight to cool down to room temperature. 5) Brush interior lightly with bottle brush. 6) Rinse with cold water until all detergent residue is gone. Bottle will be sparklingly clean!